With another Saturday promising clear and warm weather, David and I again jumped in my Ford Explorer and headed south. This time we wanted to visit some natural arches and bridges above Spring Canyon and along the rim of the Green River, west of Moab Utah. Just before hitting Moab, we turned west on the Island-in-the-Sky road and took the Dubinky Wash dirt road before hitting Canyonlands National Park. After a few miles traveling north, we took the Spring Canyon Point road heading west and then southwest. While the dirt road will take you to a really nice overlook for the Green River at its end, we took a side jeep trail heading north before the overlook. This allowed us to drive a short distance to the rim of Hey Joe Canyon, a short side canyon off of the Green River’s Labyrinth Canyon. Here we parked and hiked over the edge to find Cliffhanger Bridge, after searching the cliff edges for a while. After returning to the Explorer and driving back to the main Spring Canyon Point road again, we proceeded a short distance further towards the overlook and parked next to the road. 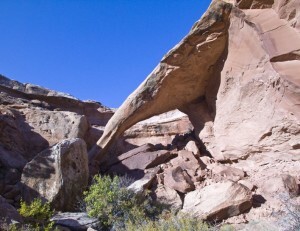 We then hiked south to the edge of Labyrinth Canyon and visited Solitude Arch which is hidden in a pocket in the cliffs. 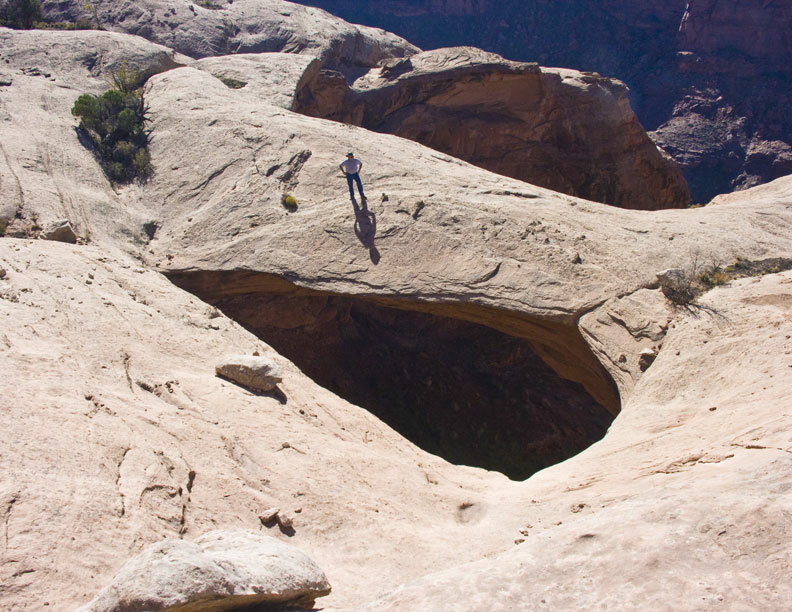 Viewing the arch from the rim was easy enough but we wanted to climb down into the pocket and that turned out to be a little trickier. 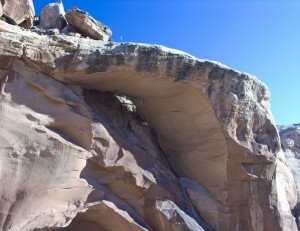 By squeezing through cracks in the rocks, we did manage to descend the first layer of cliffs a short distance from the arch. We then navigated a number of obstacles to get around the corner and down to the arch itself. By going this way, we discovered that there is a companion arch near Solitude Arch that we called Neighbor Arch. Climbing out of the pocket turned out to be harder when you have to squeeze UP the cracks. We then drove over to the overlook for a few sunset pictures over the Green River before heading home again. We had been noticing “Sun Dogs” around the sun all afternoon so it looked like the weather was due to turn stormy in the next couple of days. However, THAT Saturday was perfect!